The previously Forbidden cards aren’t the only ones with updated effects in 20AP. 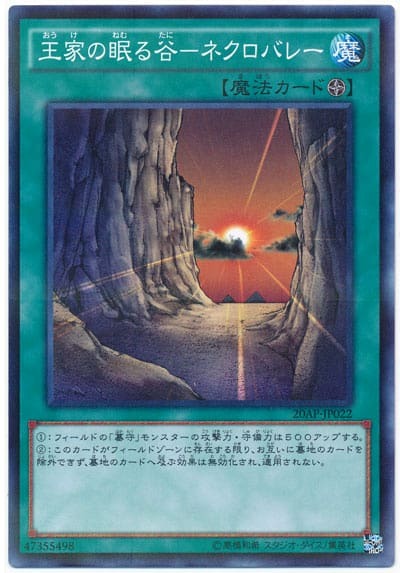 The result is that Necrovalley becomes a much stronger floodgate, because it will negate effects of cards that do take themselves out of the Graveyard that it previously allowed, such as Paleozoics’ Graveyard effects, Glow-Up Bulb, Sinister Serpent, Grapha, Dragon Lord of Dark World, Metalfoes Fusion’s second effect, Madolche monsters’ common effects, and so forth. More in-depth individual rulings will follow when I get around to posting the 20AP rulings. It is currently unknown if and when this change will occur in the TCG, as with the other updated cards in 20AP.